Today is Tolkien Reading Day, an annual event launched in 2003 by the Tolkien Society. (The date of 25 March was chosen in honour of the fall of Sauron in the Third Age, year 3019, in Tolkien’s fiction.) The reading day promotes the use of Tolkien’s writing in schools and library groups, and is celebrated in numerous countries. To mark the occasion, we’ve put together ten of our favourite quotations from John Ronald Reuel Tolkien. What are you doing for Tolkien Reading Day this year? If you enjoyed this post, you might also enjoy our interesting facts about J. R. R. Tolkien, including why the Nobel Prize committee turned him down for the Literature prize. You might also enjoy our facts about literacy and reading. More information about Tolkien Reading Day can be found here. 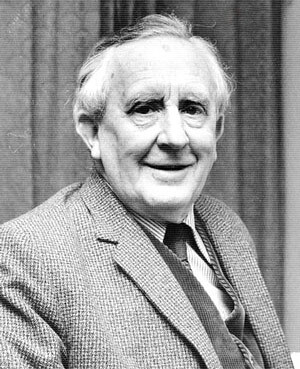 Image: J. R. R. Tolkien (author: Berluchonabj), Wikimedia Commons. How cool! My teenage daughter just picked up The Screwtape Letters to read. Happy that Tolkein transcends the generations! Indeed, all of the Inklings are an intriguing bunch of writers! It was great to have a drink in the pub in Oxford where they used to meet a few years ago. No matter the age Tolkien is able to capture the imagination from the first word to beyond the last. Thank you for a great post. Happy Tolkien Reading Day! Actually I just LISTENED to Tolkien Essential CD and some amount of the audiobook of The Children of Hurin today. Truly, a man for all seasons. His books changed my life and were instrumental in opening the door I went through to find this path through the craft of literature. I was seeking the door after reading Jim Kjelgaard and Eloise Jarvis McGraw. Tolkien gave me the clues to find the pattern for the lock. How marvellous, and well put. Thanks for the comment, and happy (belated) Tolkien Reading Day to you! How exciting!!! Love me so Tolkien!!! Tolkein Reading Day…how my mind and spirit wandered with the Hobbit and its sister books! I love that there is a formal “reading day” in his honor!! *puts down tablet, picks up book* I think I’m quite ready to read The Two Towers this afternoon. I know – I had a new-found appreciation for ‘cellar door’ after reading what Tolkien said about it! For all you Tolkien fans! I know, you are legion and this post is so interesting! My family has been reading aloud The Hobbit for several weeks now, and we just recently finished the Riddles in the Dark chapter. We all ended up writing riddles for each other this past weekend as a result. We shall all raise a tankard of Shire ale, or maybe apple juice, to celebrate the fall of Sauron! Hurrah! Thanks for the comment, Jeff, and I hope you and your family had an enjoyable day toasting the great man (Tolkien, not Sauron!). A fabulous post, with some wonderful quotes, thank you. For myth is alive at once and in all its parts, and dies before it can be dissected. My 36 year old son doesn’t get much time to read, and doesn’t read much fiction but when he was about twenty he discovered Tolkien and it really grieves him if someone does not like this famous author with an amazing imagination. I’m a little embarrassed that I didn’t know this existed. Either way, I’m glad I know now and wanted to share this! I did not know there was a day set aside for this. How wonderful. This has made my day. I am reading the Hobbit. Wonderful post! Few authors have changed the way we see the world around us, and Tolkien is one of them. Its often good and pragmatic to view our surroundings as they are, but it never hurts to read them with fiction tinted spectacles..it clears the picture..
Well said, and I agree – Tolkien’s influence has been considerable. How marvellous that there is a day to honour him! Saw this little tid bit on the ‘Interesting Literature’ blog and as I’m always happy to endorse reading I thought I’d snaffle it! I have always loved Tolkien and the way he spoke, as well as the way he wrote. One of my first ‘big girl’ books was The Hobbit, and it remains on my shelf to be read at least once a year. Thank you for these great quotes from such a great author and man. Many thanks to the Interesting Literature bloggers for alerting me to Tolkien Reading Day (see re-blogged post below), of which I was previously unaware. In one of those happy incidents of coincidence (which I do so enjoy), I came across this blog post while logging onto the computer specifically to kill time until the Lego Lord of the Rings game finishes downloading on boyfriendface’s Xbox. (Many thanks to boyfriendface for buying me the game.) I do appreciate that this is a bit of a stretch as far as ‘Tolkien Reading’ goes, but I’ll make up for it by taking The Hobbit to bed with me tonight. I mentioned in the last post that I had two successful job interviews recently. The job I have accepted is as Library Assistant in the Content Management Team at a University library. The other was an NHS post which involved cataloguing artefacts and objects marked for archival across the NHS hospital sites. The interview consisted of a presentation I had prepared on ‘The advantages and disadvantages of storage of historical information within the NHS’ followed by the interview questions. The presentation went very well (much to my relief and delight) and the interview was very relaxed and almost enjoyable, if an interview can be described in such terms. One of the interviewers had mentioned how they thought they had uncovered a Raeburn in one of the hospitals, but it turned out that it wasn’t actually a Raeburn. His optimism and hope of finding a Raeburn popped up at various points to the interview until I, somewhat confused as to why there would be, asked ‘are we talking about Rayburns….like – the stove?’ ‘No! No! Haha – Raeburn – the painter!!!! !’ Ah. Right. Now where did I put my I know nothing about art history badge…..? Oh well, what can you do? Didn’t do me any harm, and I’ve learned something new! Another thing I didn’t know I needed until it was advertised! Since I love Tolkien, I wanted to share this. I hope you enjoy it as much as I have! What a wonderful post about a truly talented and special writer. I totally missed yesterday being Tolkien Reading Day! Where do these people get all that imagination?And I thought I had strange imagination. Still a long road for me. Happy Tolkien Mr. Interesting Literature, very interesting. sometimes I wish I would not find out about these things a day after, oh well, happy belated Tolkien day! You know, it just occurred to me that 25 March was, before England moved to our modern calendar, the start of the new year (hence dates in brackets in scholarly editions of, say, Elizabeth I’s letters). I bet Tolkien intended that. I’m looking forward to seeing the Beowulf translation and comparing it to the other one in my library.